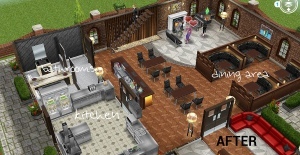 This post is to show what you need to clean up and how long it takes to unlock each section (if you use only one sim- I wouldn’t recommend that if you want it fixed up soon) you can have up to 10 sims fix up your restaurant at once which makes it a lot quicker to make it usable. But it doesn’t appear on all items, if you think something looks broken and needs fixing click on it and see. Some items also can’t be fixed until another item has been removed, so in the downstairs bathroom area you can’t get to the cobweb in the corner until the leaky roof and trash have been sorted. Once everything in that area has been removed you will be able to unlock the next area, the order and prices can be seen in this post. Thanks for this…..didn’t know this was gonna be so expensive and time lengthy project. Oh, so only ppl who completed the quest for multi-stories can start on the top floor. It’s not so time lengthy when you have a lot of sims working on it but it is expensive. 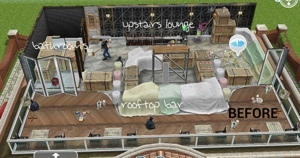 Well actually you can build the upstairs too before doing the multi story renovations quest. But it really is soooo expensive! They must have changed this in the most recent update, when I created this post you couldn’t. Yes it is strange, they have updated this as previously you could build the second floor without completing that quest but like you say it gives you time to save up! I have finished cleaning everything and my restaurant is still only a possible 4 out of 5 stars…how do I get to 5 stars? do you have dirty dishes laying around? how much did it cost you to build it? on what factors does the cost depend on? Have you looked at the list to see if you have missed anything in that area? It’s kinda crazy trying to clean up things quickly when you can’t get to some of the items until others are cleared away first. It makes an already long process longer! Luckily I have ten Sims working on it at all times! Yeah it takes a while but it’s worth it! Man oh man, does this take a looooong time, I’m just starting it, my sms are workng on the foyer, so I should hopefully be all done by the weekend, can’t wait. so you can’t press on anything to fix it? because even though the blue mark doesn’t appear on everything you should be able to still click on things to fix them. can you not click on the chairs or anything to fix them? Im having same problem with above people. sometimes a blue sign does not appear, but sometimes it does. By the way, what’s the benefit of opening the restaurant? Can this help me to make more sim money? Wow, ten hours to wait tables? Way to time comsuming to have fun. And after all that work and money to complete its….crazy. When your sims are done at the restaurant, just cancel the wait on tables action because there’s no one to wait on. 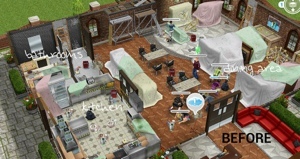 Are you supposed to have more than 1 sim repairing the same table on the rooftop?! 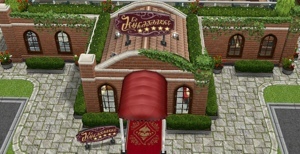 Finished the Restaurant a while back. Decided to start working on the lounge just as a side project. But wow, a lot of time and simoleons, and not really anything new to do here. AND, I just realized I need to do the final bar before it’s fully complete. Outside of faster romance, is there any reason to come back to this building regularly? Thanks for your time on this site!!! There is still a cover over the reception desk in the front room but I can’t clear it? Well it says on this post how much each area costs to build, you don’t have to build it right now anyway if you want to save up. Why does the game keep crashing every time I try to build the restaurant? 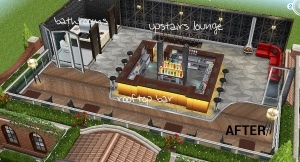 Time is running out and I can’t build the restaurant. What should I do? I forgot to say that I tried it on my IPad and on my IPhone. have you tried restarting your device and trying to build it again? This is so expensive and has cost more than 350,000. Do you think it is worth it? Do you have to buy the kitchen to fix up the bathrooms??? Yes as it says in the post the kitchen unlocks the bathroom area too. 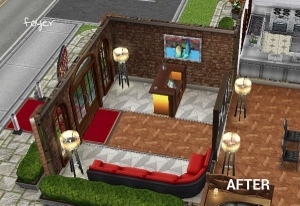 I’m not sure if this is a new update because I noticed you didn’t include this but the downstairs kitchen area also features two broken floor tiles to repair. 1 is in the kitchen, the other is in the bathroom and it takes 3 hours each to repair both of them. I just finished building the first floor. It won’t let me build the second floor until I finish the Multistory Renovations Quest. Just thought I’d let you know, so you can update the post. I have 10 sims fixing the lounge. 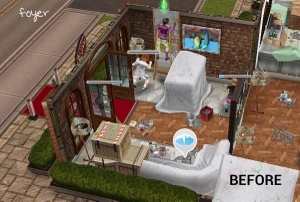 One sim is ficing chandelier, 2 others are cleaning trash (right side of the lounge, the opposite of kitchen) and another sim just finished fixing something else. However I can’t access fixing broken tiles with my free sim since it shows blue footprints. 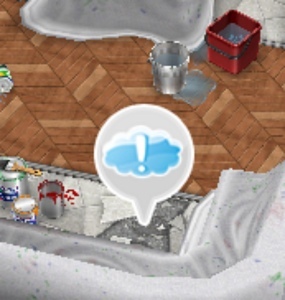 I tried cancelling the action for all 3 sims but the exclamation mark still gives to fix those 3 tasks and not broken tiles. 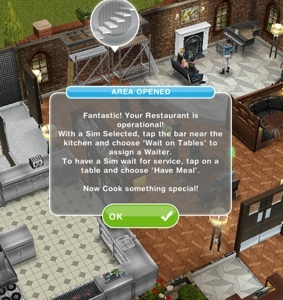 Is there anything else my sim can do or do I have to wait (12 hours) until all 3 of my sims finish tasks and I can continue cleaning restaurant? I am on level 29 and yet I have only stopped at the quest before the restaurant one, I am a little bit unsure if I should right now or not. I might end up broke seeing the cost of buying the building and renovating it. Which is why I barely could buy any of the stores that I unlocked from the modelling hobby. I have up to 107 LPs, and I learned not to waste them unless, there is a use 1 lp option. So what should I do? The 30 social points I saved I used it to buy a ‘renovators home’ in a standard plot since I didn’t want to waste money. 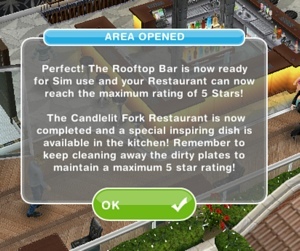 So after I finish building and repairing every part of the whole restaurant I can start to get a 5 star rating. You don’t need to build the whole restaurant to complete the quest, you just need to open the front door, until you do that the quest will stay and you will be unable to complete the next quest. No it doesn’t, it has the chopping board there but you still have to complete the cooking hobby for the first time to unlock the chopping boards for your sims houses. PS: Can I add you to my neighbours? Unfortunately I am unable to add anymore neighbours as my account is full, sorry! I finished building the quest , i have repaired everything. Now im stuck because there is an exclamation point above the stove but im not sure what to cook ! You don’t have to cook anything if you don’t want to, it is just showing you can complete the cooking hobby there now.